A man once caught stealing was ordered by the king to be hanged. On the way to the gallows he said to the governor who escorted him that he knew a wonderful secret and it would be a pity to allow it to die with him. He told the governor that he would disclose the secret to the king. He would put a pomegranate seed in the ground, and through the secret taught to him by his father, he would make it grow and bear fruit overnight. The next day the king, accompanied by the high officers of state, came to the place where the thief was waiting for them. There the thief dug a hole and said, “This seed must only be put in the ground by a man who has never stolen or taken anything which did not belong to him. I, being a thief, cannot do it.” So he turned to the Vizier who, frightened, said that in his younger days he had retained something that did not belong to him. The treasurer said that dealing with such large sums, he might have entered too much or too little. Even the king confessed that he had kept a necklace of his father’s. The thief then said, “You are all mighty and powerful and want for nothing and yet you cannot plant the seed, whilst I who have stolen a little because I was starving am to be hanged.” The king, pleased with the ruse of the thief, pardoned him. This story is clever and engaging, and yet it is still somewhat ambiguous. The thief, fighting for his very life, acted wisely and swiftly. He engaged top officials and made them look at their own humanity. But the thief never ceased to be a thief. 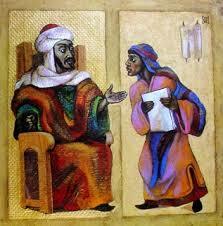 And in telling the story of the pomegranate seed, he may not have been being completely truthful. Yet, he is rewarded with the thing he values above everything else, his life. Ambiguous may be the most positive thing we can say about this story. I want to suggest that it is in its complexity, in its confusing nature, that the redemptive message about God’s kingdom and God’s love for us is to be found. For this is the question that we need to ask about all of the parables: what is Jesus saying about the kingdom? What is Jesus saying about God’s love? What must we do to be saved? Is this not, honestly, always the question? What must we do to be saved? The dishonest steward has the same question. What must he do to redeem himself? How can he preserve that precious gift from God, his very life? There is much that is not said in this parable. There is a backstory that includes the economics and business practices of the day, that suggests that the master was not much more honest than his steward. The steward’s behavior appears utterly self-serving and not to be commended. But in the parable, his zeal and resourcefulness is commended. The steward in this story is on a mission. We, too, are on a mission. Each one of us. The word mission comes from missio—to send. Mission literally means our having been sent. For what have you been sent? What is your mission? How can you use your zeal and resourcefulness to carry out your mission? What God asks of us is to be zealous, resourceful, and—in a perfect world—honest in our mission. In this place, the litany of little things might include: welcome a visitor, share your hymnal with someone, bring a plate of cookies to coffee hour, pull some weeds in the courtyard, change lightbulbs, help with a parish mailing. Whoever is faithful in a very little is faithful also in much. The story about the dishonest steward’s belated attempts to be faithful shows a God’s-eye view of a person. You know how when someone we love is close to death, or has died, suddenly all of their most annoying qualities either evaporate completely, or become loveable? This is what I mean by “God’s-eye view.” This is how God sees us all of the time. Even when—as I said last week—we are at our very worst. What must we do to be saved? Our faith teaches us that we were saved long ago, by Jesus’ one act of self-giving love on the cross. And we are saved anew each day. We don’t earn salvation, we receive it and, to the best of our human ability, live it. God adores us. God loves us even when we are misguided and confused, using God’s gifts of wisdom or prudence to serve ourselves instead of the kingdom. God’s tolerance for ambiguity and confusion is so much greater than ours. We cannot begin to understand the dishonest steward from God’s perspective any more than we can understand our own story in God’s eyes. God can sift through the complexity of how we live our lives and pick out what we have done right and where we have been faithful. Our job is not to run away from God, but to offer to God our own stories, our own mixed motives and best efforts, our divided loyalties and our confusion, and to bring them to this table, to share in this holy feast of our redemption. My dear departed stepfather used to run a small brokerage firm in Boston. He worked very hard and it was nearly impossible for him to ever take a vacation. We finally figured out that it was hard for him to get away because he was terrified that one of two things might happen while he was gone: either the place would fall apart without him, or it wouldn’t. I’ll take the latter any day. And not coming back to a hundred fires to put out has given me a chance to reconnect with my own ministry priorities. Today’s gospel is about Jesus’ priorities. We often focus on the substance of these two stories, about the lost sheep and the lost coin: the substance being Jesus’ ministry to the last, the least, and the lost. Especially, here, to the lost. But it is also a story about who Jesus is and where you can expect to find him: with tax-gatherers, sinners, and others who have lost their way. It’s a story about Jesus clarifying his focus. Now, to one of the parables. It is interesting to me that when we read about Jesus the Good Shepherd in the gospel, we usually focus on the Good Shepherd in the tenth chapter of the gospel of John, part of which we read each year on the fourth Sunday in Easter Season. You all remember that Good Shepherd, right? 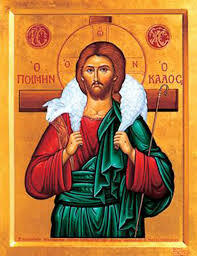 The one who lays down his life for his sheep, the one who is the narrow gate through which we are all invited to enter. But all of our images of the Good Shepherd come from this brief parable about the guy who catches a runaway sheep and brings it home, rejoicing. In these images Jesus is usually depicted cuddling a little lamb, the way you or I might hold a baby. 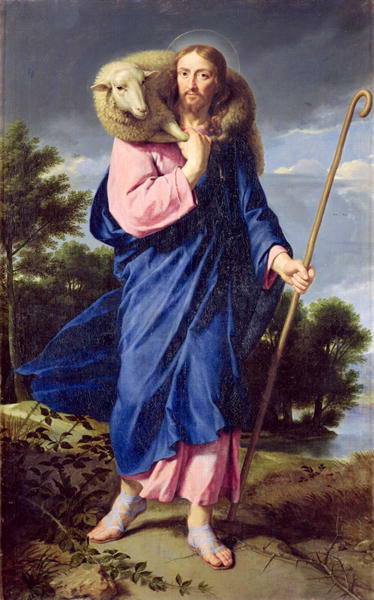 In some images, he’s holding a sheep the way a shepherd would carry a captured runaway over his shoulders like a mantle, two ankles in each hand. The sheep are almost always very white, and very cuddly. Now, most of you know that I recently returned from a 192-mile walk across England, from the Irish Sea to the North Sea. I can say without exaggeration that at least 130 of those miles were through sheep fields. In fact, one could say that rural England is one enormous sheep field. (We ate a whole lot of lamb.) So I feel that I can say with some authority that that we saw very few fluffy, cuddly, white sheep. Sheep are, as I have said before, smelly, stupid, and occasionally mean. And the ones that go missing, wandering off by themselves? They are usually the most ornery and unkempt of them all. Yet Jesus loves them and rejoices in them. Just as God does, with us. When we are at our very worst—when we feel like everything is going wrong, when relationships aren’t working, everyone is mad at us at work, we’re not communicating well with our beloved—these are often times when we find ourselves running as far and as fast as we can away from God. Imagine a God who runs after us, and is willing to pick us up, dirty and kicking, and carry us back to where we belong. And rejoices while doing it. This is what Jesus does. This is what God is like. God seeks us out and rejoices over us, not in spite of our being at our very worst, but because we are at our very worst. God loves us not in spite of our sins but because of our sins. Now, lest you think that means God actually wants us to sin as much as we can in order to be especially lovable, that’s not what I’m saying. I am saying that there is no such thing as being too lost or too sinful or too out there for God. Wherever we are on our journey, we’re right in the center of God’s heart. There’s a fun game I once witnessed in a youth group at another church, which you may be familiar with. The kids were all given very long spoons, and a huge bowl of M&Ms sat on a table in the middle of the room. The kids had to figure out how to feed each other with the M&Ms, and how to feed as many other people in the group as possible. It’s not just a partner game. I think this is a great image for the kingdom of God. In God’s kingdom, the one that Jesus came to proclaim and the kingdom we are called to proclaim, I believe we are supposed to feed one another, and rely on one another to feed us. We are called to do the same for one another that Jesus does for us: to seek out the lost, and to proclaim the good news of their presence among us. And those who are lost—some weeks it might be you; some week it’s me—are not always the human equivalent of white, fluffy, cuddly cuteness waiting to be found. And yet, I hope when we do find someone at their worst, we will rejoice as much as Jesus does. It is so, so, so good to be back. I want to begin with a confession. I didn’t go to church much on sabbatical. Most weeks I had a good reason, like I was on an airplane or I was in the middle of a sheep field. When I was in big cities, I went to the places one Ought to Go: in Edinburgh, I went to St. Giles; in London, I went to St. Paul’s Cathedral and Westminster Abbey. But some weeks, I knew that if I went anywhere besides St. David’s, I was just going to do a whole lot of comparing, the other church was going to come up short, and it wasn’t going to be an actual worship experience. So it’s wonderful to be back here where I can worship with all of you. There is one thing that I don’t want to let go without saying, and that is thank you. Thank you to James, Mary Sue, Linda, Gary, Emily, Josh, Ben, and everyone who kept this place not just going, but humming. Everything you’ve been doing…don’t stop! And thank you to the vestry, for letting me go on sabbatical. And thanks to all of you for showing up today to welcome me back. If you’re new to the parish and are wondering who the heck is this lady up here….I hope you’ve gotten a wonderful welcome here over the summer. We’ll talk. Early on in the 192-mile, 18-day walk across England I took with Mark and Nathan, we were on a country road somewhere between the towns of Shap and Richmond. A warning sign on a fence caught my attention. 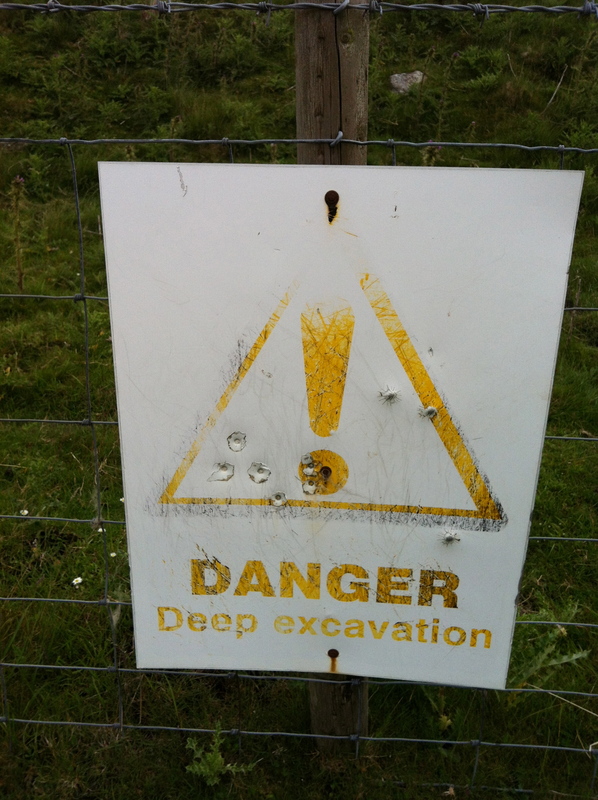 It showed a big exclamation point, and it said “danger: deep excavation,” I took a picture of this sign and sent it to my writing mentor, who is always telling her students to excavate their stories. By this she means: go deeper. You go along like this ————- for a while and then you drop down, and go deeper. I think Jesus always wants us to excavate what he has to say, to dig down and explore the layers of meaning. Especially today’s gospel. On the face of it, this morning’s gospel is a bit of a non-starter. Whoever comes to me and does not hate father and mother, wife and children, brothers and sisters, yes, and even life itself, cannot be my disciple. Well, sorry, Jesus, I guess I fail. I love my family and I love my life, so either a) I can’t be a disciple, or b) I can’t take this gospel passage seriously. If we excavate, if we dig deeper, what do we get to? If we read this whole gospel, not just the hard-yet-catchy parts about hating our families and giving up all our possessions, we see that what we have is a collection of sayings, and each of the sayings is really about the same thing. If we dig down, we get to this kernel: being a follower of Jesus costs something. It costs something different for each of us, but it usually costs some form of attachment. I’m going to ask you a question, and I want you to dig deep down into yourself for the answer. Don’t edit—you don’t need to share this with anyone. Here’s the question: what’s the first thing that comes into your mind when Jesus says none of you can be my disciple without giving up all your possessions? What is the hardest thng for you to give up? The barrier to discipleship is not the possession, it’s our attachment to the possession. And attachment is not just about possessions, as you all well know. My attachments include a particular idea of myself as capable of some things, and not others. The collect we prayed this morning prays to a God who always resists the proud who confide in their own strength. Confiding in our own strength, rather than God’s, is an attachment. My attachments include needing things from family members that they cannot always provide. I think this need is what Jesus wants us to let go of, when he tells us to hate our families. My attachments include preconceived notions of other people: that person is going to be critical, that person is going to be stingy. That other person is never going to let me down. Etcetera. Dig down, and think about whether you have an attachment to particular expectations of other people. The cost of discipleship is letting go of these expectations, positive or negative, so that we—just like Jesus—can be fully present to whoever is in front of us at any given moment. One of my personal favorite barriers to discipleship is my attachment to outcomes. I get so attached to my imagination’s own particular version of success that I miss the chance to witness God’s work. This has happened to me over and over again in this place, from the earliest months when I was here practically all by myself, meticulously planning events to which no one came, to this sabbatical time, when all of you accomplished great things in ways we didn’t even plan on! When we give up these attachments to our own particular expectations and outcomes, life becomes much more of an adventure. Especially church life. Who knows what will happen? Who knows how you or I will deal with whatever happens? I don’t know about you, but I feel like I am beginning a new chapter in my own life as part of the St. David’s adventure. And I’m excited. I want to enjoy watching the mystery of our life as a community of disciples unfold, without my attachments, my anxieties, and my expectations getting in the way. More than anything else, I’ve looked forward to sharing Eucharist together. It is such a privilege to say mass in this place, and even though the words are pretty much the same, week after week, it is different every time. When we gather around this table, I hope you will bring with you all of your attachments to leave at the altar. You won’t need them for discipleship. Instead, take away from this altar the mystery of our journey. Let’s see where it takes us.